Welcome to Addis Ababa! You will be met by a Representative at the airport and transferred your chosen accommodation. The day will be spent visiting the Ethnographic Museum, an ideal place to start learning about Ethiopia's rich ethnic diversity. The museum has an impressive array of religious crosses, triptychs and murals. After, you will visit the National Museum to view famous exhibits like the Bones of Lucy and then to the largest Ethiopian Orthodox Cathedral - the Holy Trinity Cathedral. Today you will be transferred to the airport for your flight to Bahir Dar. On arrival in Bahir Dar, you will be embark on a boat trip over Lake Tana to visit 2 of the renowned Island Monasteries of the Lake, namely: Ura Kidane Mihret and Azua Mariam. They both have wonderful paintings which depicts the scene from the Old and the New Testaments of the Holy Bible all over their walls. After lunch, drive to the Blue Nile Falls (35km one way) – known locally as Tissiat – which means “Smoking Water.” The Falls are 99m wide and the water plunges some 45m, giving rise to picturesque stream clouds and rainbows. Upon arrival, you will be transferred to your next stay on the shores of Lake Tana. After breakfast, the drive to Gondar will be approximately three hours. En route, you will visit the Amhara’s village and the wetlands between the towns which support many water birds. Arrive to Gondar, the imperial city of Fasilidas! The kings of Ethiopia based their power in Gondar for two centuries. The city was the first capital of the Ethiopian empire, which began in 1632 with the reign of Fasilidas. 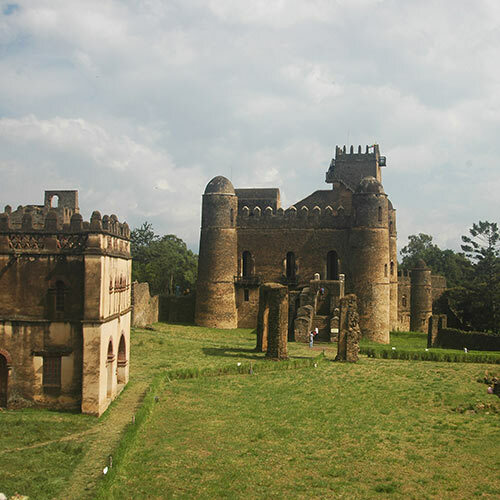 In Gondar, there are a dozen castles built by various emperors over the course of 236 years. Many picturesque ruins lie in the royal enclosure like the fairy-tale castles dating back to the 17th century. 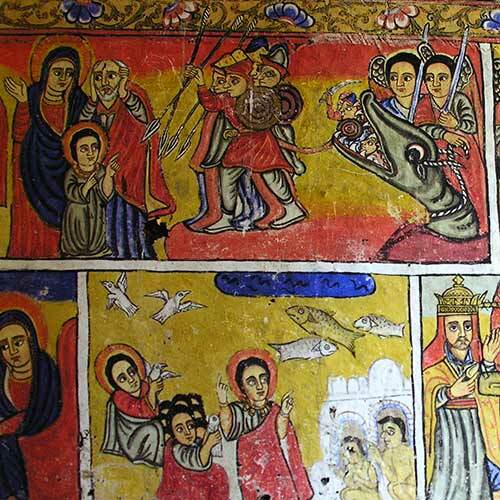 Visit Debre Birhan Trinity church, reknowned for its magnificent murals adorning the roof and the walls of the church and Kuskuam church. After breakfast you will be transferred to the airport for your flight to Lalibela. After checking into your hotel, begin your tour of thefamous churches of Lalibela. The first group of six churches lies in rock cradles, one behind the other: Bet Golgotha, Bet Mikael, Bet Mariam, Bet Meskel, Bet Danaghel and Bet Medhane Alem. Bet Medhane Alem, the largest, is built like a Greek temple. In a corner are three empty graves symbolically dug for biblical patriarchs Abraham, Isaac and Jacob. Bet Giyorgis, possibly the most elegant and majestic of all the Lalibela churches, lies somewhat isolated in the southwest part of the village on a sloping rock terrace. It can only be reached throw a tunnel. The group of four, south of the Jordan River, comprise of Bet Emanuel, Bet Mercuiros, Bet Abba Libanos and Bet Gabriel-Rufa'el Bet Emanuel's elaborate exterior is much praised by art historians. Today, you start with a visit to a church just outside Lalibela, Naktolaab. 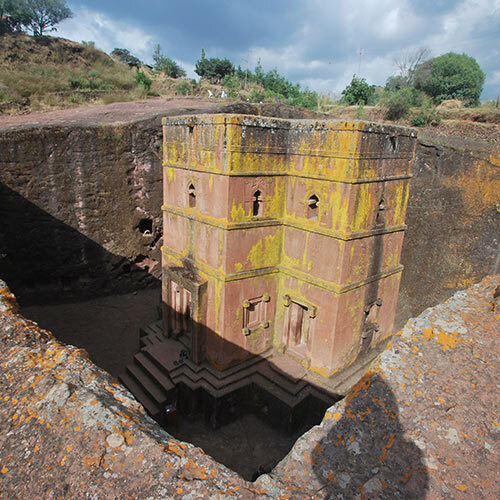 It is named after its constructor, the nephew and successor of King Lalibela. This relatively simple church built around a shallow cave in which several holy pools are fed by natural springs. It has many treasures, some of which are claimed to have belonged to Naktolaab himself. This includes paintings, crosses and a leather bible. After lunch, you will visit the second group of churches and Bet Giyorgis, which is arguably the most majestic – and the most photographed – of all Lalibela churches. In the evening, take part in a traditional coffee ceremony in the local house in Lalibela. Dinner will be served at Ben Abebe Restaurant and offers traditional Ethiopian and western food in a comfortable surrounding with spectacular views. In the morning, you will be transferred to the airport for your flight back to Addis Ababa. Upon arrival, transfer to your hotel before your next tour. Today, you will visit Merkato is located in western Addis Ababa, It is the largest open-air market in Africa, offering an array of colours, aromas, costumes, produce and jewellery. In the evening, you will have a chance to experience some of the cultural dances and traditional meals at the Addis Ababa Restaurant. Ethiopia is a mosaic of people with more than 80 languages, different lifestyles, costumes and cultural dances. Before your final transfer to the airport, pass by Taitu Hotel to enjoy a Jazz night.